It can take months or even years of practice until you're able to hit a speed bag so it produces a steady rhythm. Before the sound of your speed bag workout can turn heads at the gym, however, you must adjust the bag so it's at the proper height. Hitting a speed bag that's positioned too low or too high can be difficult and feel unnatural. Although the shape an appearance of speed bags can vary slightly according to their manufacturer, they generally have a tear-drop shape. When adjusting the height of your speed bag platform, ensure the thickest part of the bag — known as the belly — is at the same height as your nose and mouth. This position allows you to strike the bag effectively. 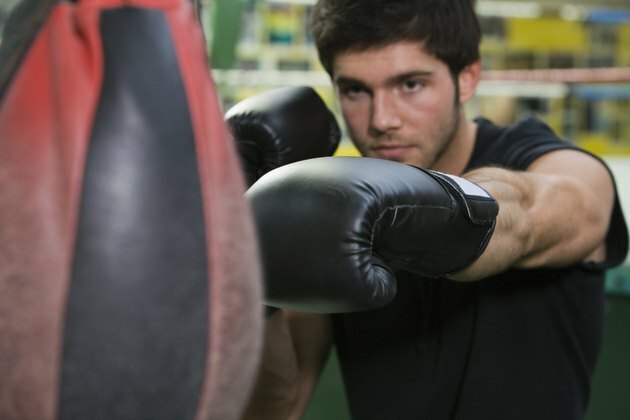 You might occasionally see a boxer hitting the speed bag while wearing bag gloves, but most athletes perform this part of their training routine with their hands wrapped. Working the speed bag allows you to fine-tune your speed, accuracy and timing. The workout also requires you to keep your hands elevated and moving for three minutes at a time, which is critical to success in the ring. Can a Punching Bag Workout Help Tone Your Abs?